I recently read “A Dog’s Last Will & Testament”. It reminded me of how great it can be to rescue a dog and provide for it a wonderful home and life. But the task is not that easy. My family’s last rescue has been our greatest challenge. From the dog’s perspective, all it had seen were commands, scoldings, spritzings of water to the face, being separated from family and friends by being put outside and being forced to wear a muzzle. Why treat the dog so unkindly, you may ask? Because we love him. Shortly after adopting our rescue, my sister-in-law came to visit. While there, the dog would not give her a moment’s peace. After repeatedly nipping at my sister-in-law, we found that the negative reinforcer of water spritzing kept the two separate. For clarification, we spritzed the dog and not my sister-in-law. We discovered that the function of his nipping behavior was that he had experienced a great deal of trauma ranging from being hit by a car, having a broken hip and being abandoned for two days. It appears that while he was wounded and abandoned, he must have been either frightened or teased by people on bikes and skateboards. His nipping was his response to being afraid. He was afraid of my sister-in-law, so he reacted by nipping at her in an attempt to keep her at bay. As she and others would visit my house, our training methods slowly helped to rescue reduce his nipping behavior. Visits to the vet were an experience in themselves. One of our lasts visits had the vet, the technician, my wife and myself knocked around the room as we drew blood for tests, swabbed his ears with treatment and dealt with other annual health inspections. All the people heard in the waiting room was smash, bang and people being slammed against the door. Why? Because we love him. It has been a little more than a year now since we have had him. 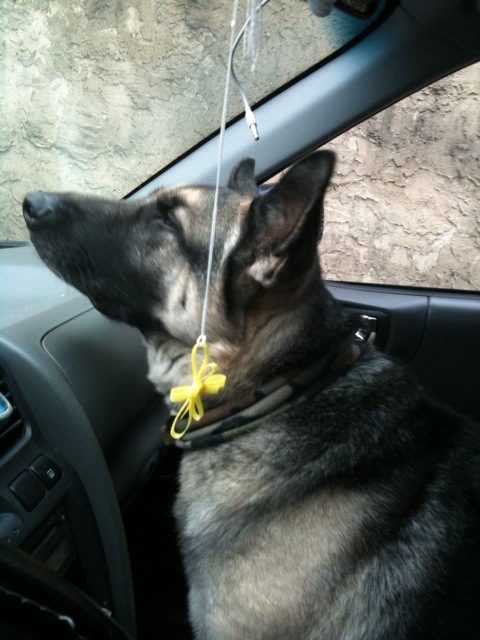 He is much more calm and is developing into a strong, independent German Shepherd and less trauma reactive. Most people would have put him down and written him off as not salvageable. But, we saw something different. Through it all, I wonder what the dog thought? At the vet’s office, he more than likely thought we were trying to hurt him and when being trained not to nip or bite, he probably saw us as mean. But all we did was love him. What is God trying to do in your life? As he works, how do you see him? Are you seeing his dealings as acts of love or is your perception skewed by the training experiences that he brings into your life. He is working you into what he sees you can be. Be patient and remember, he loves you. Many times we face difficulties and seek God’s face for deliverance. At times, our prayers are for God to perform a work in a person so that their actions will bring about a change to the circumstances in our lives. Such an example is found in the life of Abraham’s servant as he seeks a wife for Isaac. He prays that she will make a particular offer to his request? And he said, O Lord God of my master Abraham, I pray thee, send me good speed this day, and shew kindness unto my master Abraham. Behold, I stand here by the well of water; and the daughters of the men of the city come out to draw water: And let it come to pass, that the damsel to whom I shall say, Let down thy pitcher, I pray thee, that I may drink; and she shall say, Drink, and I will give thy camels drink also: let the same be she that thou hast appointed for thy servant Isaac; and thereby shall I know that thou hast shewed kindness unto my master. Does this sound like something you have prayed for in the past? If so, you may have ended up disappointed like I have? Oh, there were times when my prayer was answered specifically, but more so than not, the request made never came to pass? What is so troubling about this is that it worked for Abraham’s servant and even in the past for me? But why not every time? It is from situations like these that the faith of God’s people begins to weaken? When our prayers go unanswered, we push through the doubt and hold on to faith only to see our hopes dashed again as we pray for God to work in the will of others. When our prayers again yield no results, our faith becomes even weaker. If prayers like this continue, it only will be a matter of time before our hearts become greatly wounded from God’s apparent lack of intervention. We soon will become indifferent, eventually frustrated and even angry with God. Why did he fail us? Why didn’t he answer our prayers and work in the hearts of others and make them do what we requested? He did in the past: why not now? Imagine a family broken by drunkenness. The remnant of the family prays for the wayward family member. Their prayer is that the drunken father would visit his children on their birthday. The day comes and goes and no visit. A holiday approaches and the family members again pray for the father to visit, but instead he wallows in his drunkenness. Disappointment looms in the hearts of those praying. How many times do prayers such as these need to go unanswered before unbelief, anger and bitterness begin to fill their hearts? Again the question is asked, “He answered prayers like this in the past, why not now? The truth is, he never really did answer such type prayers in the past. Let’s take another look at the servant’s prayer and see it from a different perspective. When he asked for the bride he should choose to provide him drink and also offer to water his camels, could his prayer request have been the result of God leading him to choose his words according to what God already knew would happen and from that interaction indicate who would be the future wife of Isaac? God knew the character of Rebekah and that her servant heart would offer to meet the needs of those with whom she interacted. God also knew that he wanted Isaac to marry Rebekah? So in order to indicate to Abraham’s servant the woman to choose, God, by his spirit, led him to pray according to his foreknowledge. 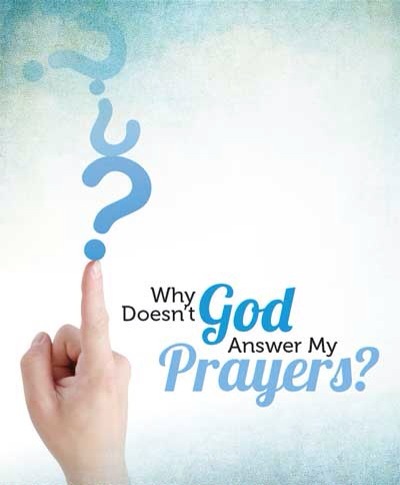 In short, when he prayed as God wanted him to pray, his prayers were answered. It continues to work like that today. Consider these two familiar passages of scripture on prayer. If ye abide in me, and my words abide in you, ye shall ask what ye will, and it shall be done unto you. (John 15:7). And this is the confidence that we have in him, that, if we ask any thing according to his will, he heareth us: (1 John 5:14). What each of these verses have in common is that the person asking or praying is in harmony with God. When we are abiding, God is working his will through us and when we ask according to his will, we are guaranteed to receive what we ask. So instead of praying for what we want, we should yield ourselves to God and ask him to guide us to pray as he wants. We may find ourselves praying in ways and for things beyond what we would have imagined. Consider again the broken family and their desire for a united family. God may lead them to pray for people with truth to come into the wayward’s life so that their heart may become softened. They may begin praying for grace and strength to deal with their hurt instead of the hurt being removed. God may lead them to pray for others who are experiencing similar hurt and for their consolation. Each of the latter prayers can be answered without God superseding man’s free will. We must recognize that prayer is not a tool for us to use to gain our will or desire, but a manner by which we are to gain from God what we need to live our lives for him. Before you pray, ask God to guide you to pray according to his will. You will experience more answered prayers and gain exactly what you need to endure the trials that you will face. 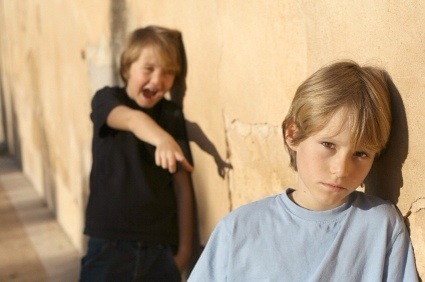 Did you ever get picked on when you were a kid? Of course you have and if you were like the rest of us, you purposes in your heart that you were not going to cry. No matter what people did to you, you would harden yourself to make sure that you wouldn’t allow yourself to give in. You may have ran home, gone in the house and cried your heart out, but you weren’t going to do it in front of them. Did you know that many people are still acting the same way. They expanded from not being moved to cry to where they don’t allow themselves to be moved. Sadly to say, they act this way towards God. Somewhere along the line, things in life did not work out as planned, so they decide to take over and take change. Regardless of what God does, they purpose not to give in to him. Stop and think, can anybody really win when they harden themselves against God? Of course not, but people do it anyway. The children of Israel continually did it while they wandered in the wilderness and God’s people today are no different. What they fail to recognize is that they are yielding to somebody. Everybody does: they either yield to God or they yield to the enemy who is moving their heart against God. How foolish. What can we do? What should we do? God says that we should instruct them in meekness in hopes that God may give them repentance. (2 Timothy 2:25). Until that time comes, hold on because the road will definitely get rocky. 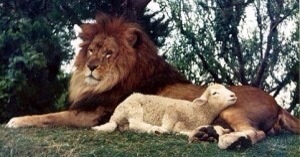 What will make a lion lie down with a lamb and what needs to happen so that a child can play at the snake’s den? The Scriptures say that this and other events will happen when the Earth is full of the knowledge of The Lord. It appears that animals and humans alike will respond and act upon the knowledge or truth of The Lord. Until that time when that the Earth is full of the knowledge of The Lord, man and animals will continue to act without knowledge. The world became void of knowledge or truth when man introduced sin into the world. Once truth was gone, the entire creation fell and has functioned in that manner since then. As fallen beings, man and animals respond to situations with their fallen nature. Animals function in fear or a fighting for life. Man also responds with fear, but also with greed, lust and anger. As long as man is without truth or the Knowledge of The Lord, he will always function that way. When Christ rules during his millennial reign, everything will change. It will be then when war ceases, the lion lies with the lamb and the children play by the snake’s den. But is that our only hope? Must we be forced to succumb to our sinful natures and battle life in fear? The answer i, no. Because of truth from The Lord, we do not need to live as other fallen beings. We may not have complete truth, but we have enough truth to enable us to experience some millennial kingdom living now. Because of truth, we do not need live in fear. If we function in the realm of peace, we need not fearfully fight in order to survive. By being content with what The Lord has provided to us, we no longer need to reach out with greed for things which will not satisfy. If we rest in the Sovereign One, we will no longer need to exact revenge upon our enemies or those who have wronged us. If the knowledge of The Lord will keep savage animals from devouring one another, should not truth from God’s word produce some of that behavior within man now? Are not the fruit of the Spirit a like manifestation of truth’s effect upon man.